This scheme is the first of its kind in Europe and provides a better understanding of methods for removing metal contaminants from water. Force Crag Mine, in the Lake District National Park, is a major source of metal pollution to local waterways. The abandoned mine is situated on land owned by the National Trust. The Coal Authority worked in partnership with the Environment Agency to assess the level of environmental damage, and together with Newcastle University and the National Trust, devised an innovative pilot scheme to reduce the levels of metal pollution. From 1835 until 1991, the mine was worked for zinc, lead and barytes. Metals from the mine, including zinc, cadmium and lead, pollute the Coledale Beck, a tributary of the Newlands Beck and the River Derwent and Bassenthwaite Lake Special Area of Conservation. A study for the Environment Agency and the Department for Environment, Food and Rural Affairs, identified the environmental impact from the metal mine as being one of the worst in the UK. To treat the metal rich mine water we constructed a full-scale passive mine water remediation scheme. This pilot scheme is the first of its kind in Europe and aims to provide a better understanding of the passive method of removing metal contaminants from water. Together with Newcastle University, we designed the project to divert water from the Level 1 adit and route it through a buried transfer pipe to two vertical flow ponds (VFP) for treatment. 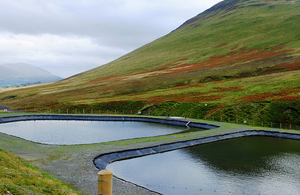 These ponds are lined with a geomembrane and filled with a compost treatment mix. They were built using the existing bunding of the former mining tailings lagoon. The water is then fed into the VFPs, where it flows down through the compost in the ponds and passes into a wetland, vegetated with soft rushes. The wetland filters any remaining solids in the water prior to discharging into the Coledale Beck and also aids with oxygenating the treated water. Force Crag Mine is an open access area in one of the UK’s most popular National Parks. The Scheduled Monument and Site of Special Scientific Interest status of the site resulted in added challenges in obtaining permission to construct a treatment scheme from the relevant regulatory bodies. We worked closely with partners and local residents to gain access to the site, which is via a 4km single track. The track is the only access route available to the site, so some works were undertaken to enable the safe transport of heavy machinery particularly in the unpredictable weather conditions. We established a 12 month intensive monitoring programme at the remote location to fully understand the outcomes of this pilot scheme. The programme has been extended for an additional three years to further our understanding and optimise the treatment system, working with our research partner Newcastle University.